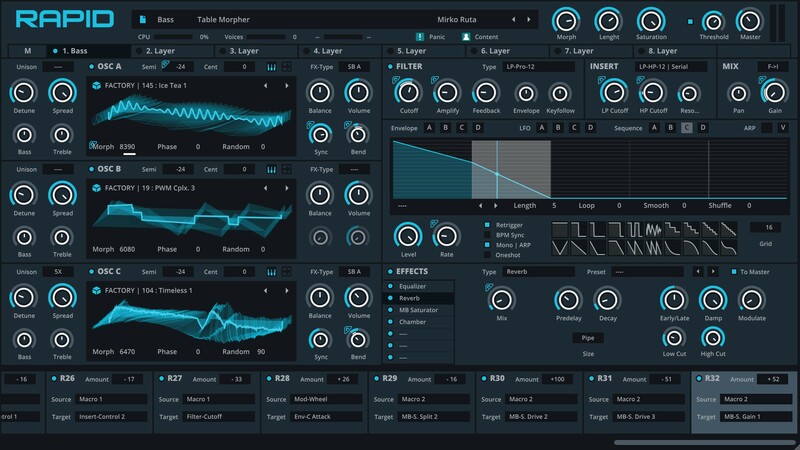 RAPID is a modern polyphonic hybrid synthesizer designed to bring together fast workflow and powerful synthesis techniques. 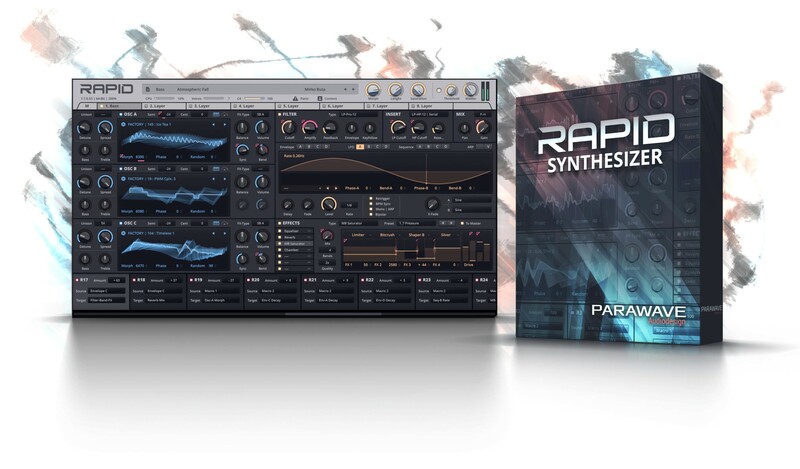 The unique layer engine that powers RAPID lets you shape and customize all aspects of your sounds, resulting in dynamic and fat patches, ready for production, performance or simply inspiration. 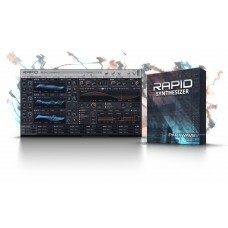 RAPID comes with a great variety of production ready sounds. Each preset designed and handcrafted for playability and creativity in mind, passed through careful quality control. All macros are linked to allow an easy control of the most striking sound aspect. Each of the 8 synthesis layer can be controlled separately and consist of the following elements. Multi-Samples with Velocity and/or Round Robin. Up to 8x Unison voices. 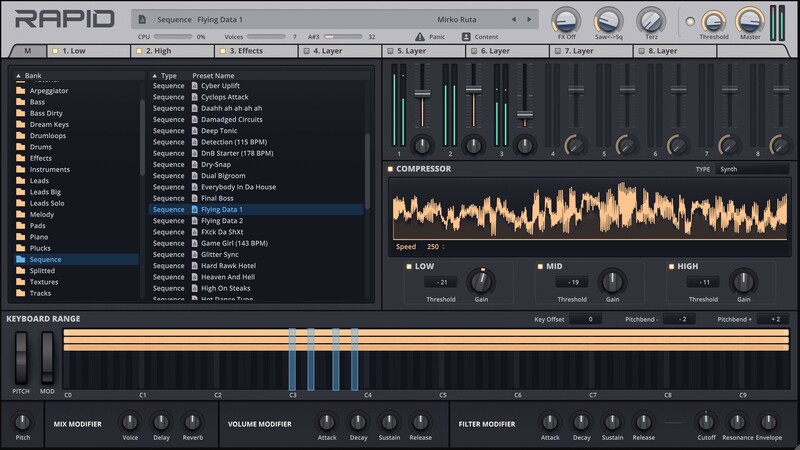 Bass and Treble control per waveform. Tube Distortion and Asymmetric Clip. Phase Modulation and Ring Modulation. Phase & Ring Modulation from other Oscillators. Phase Bend, Phase Double and Phase Mirror. Hard Synchronization and Formant Shift. Pulse-Width Modulator and Phase Overlap. Chaos Phase and Noise Generator with smooth Brown/White/Pink fading. 6, 12, 24 dB Lowpass and Highpass. 12, 24 dB Bandpass and Peak. 24 dB Multi-Bandpass and Multi-Peak. 12 dB Notch and Multi-Notch. Acid, Analog, Legacy, Vintage and Xtreme Lowpass. Tube Distortion, Overdrive and Tone-Fuzz. 4x ADSR envelopes with adjustable slopes. 4x LFOs with dual waveform and phase bending for complex shapes. 4x Sequences with up to 32 steps, with loop and one-shot mode. 32-Step pattern steps with adjustable lengths. Up, down, random, queue and chord pattern mode. Legato mode with note glide. Reorder of insert and filter processing. 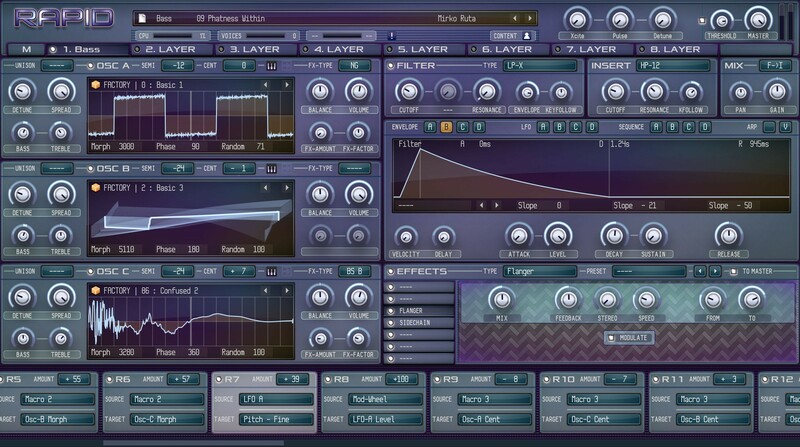 Reverb with Area, Hall, Room & Pipe mode. Delay with smooth delay time modulation. Dual Delay with Cross-Feedback and Ping-Pong mode. Tonal Delay with tunable delay times. Chamber for very short reverb acoustics. Smooth Tube Distortion with dynamic EQ Boost. 2-Band Waveshaper with adjustable crossover. 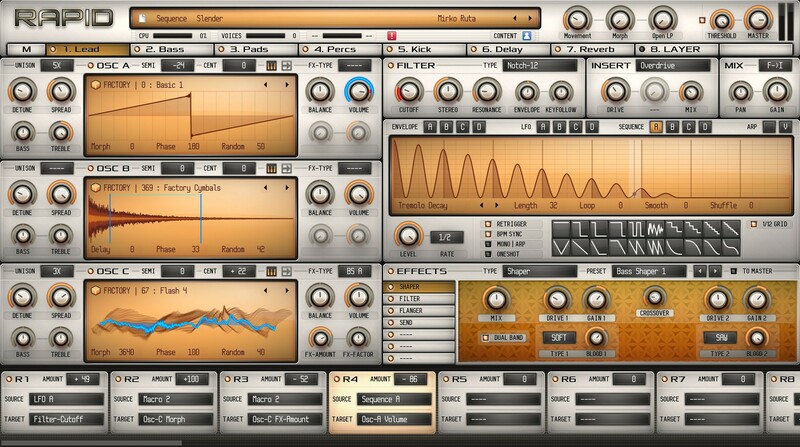 4-Band Saturator with 16 different insert types. 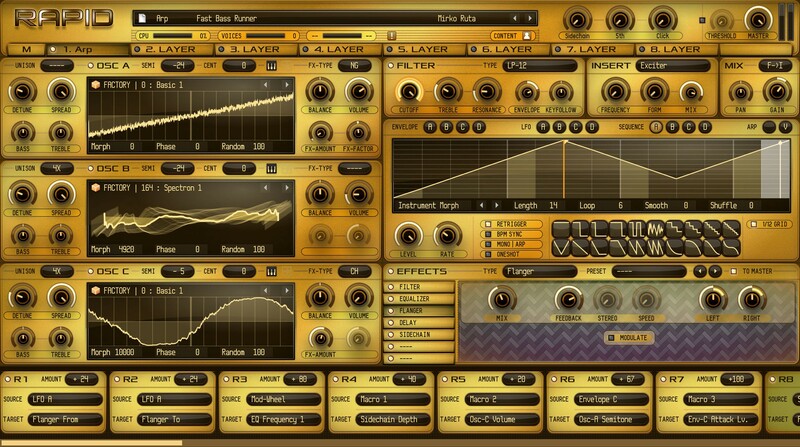 Phaser, Flanger, Chorus with precise modulation depth control. 3-Band-Equalizer with low-pass, high-pass, low-shelf, high-shelf and bell filter. Talker Filter with Male, Female and Child vocal mode and internal crusher. 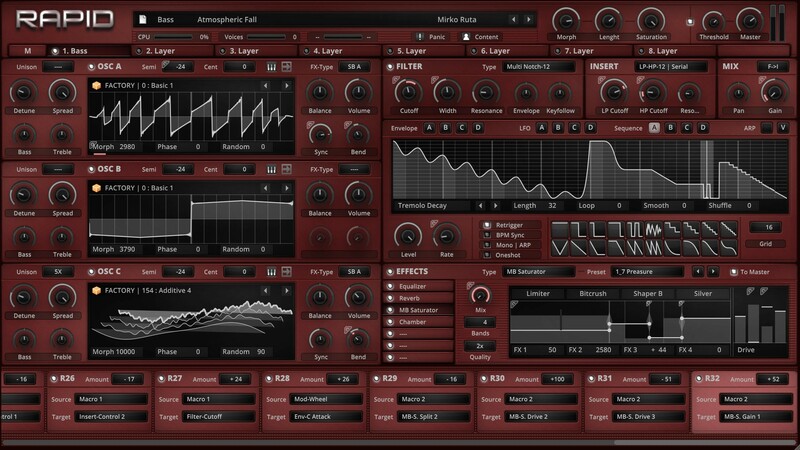 Dynamic Compressor with Digital and Analog mode. 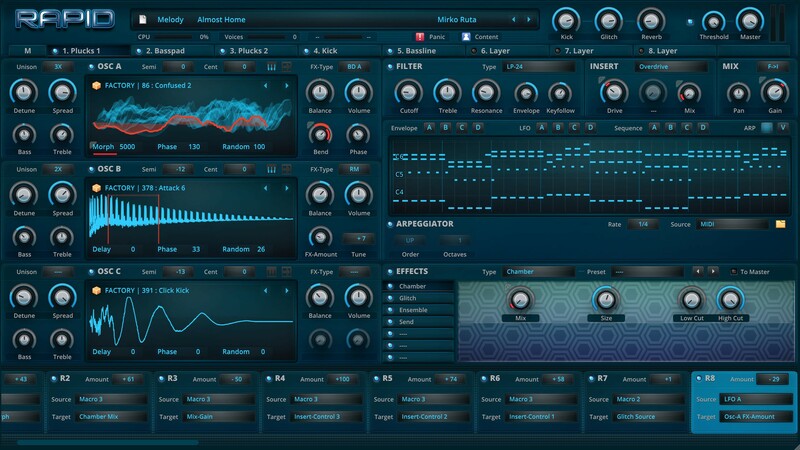 Syncable Sidechain leveler with different shapes. 32-step stereo Trancegate with Shuffle-Rhytmn control. Send Router, for parallel mixing with other layers. Tapestop with adjustable slope, start and stope time. Glitch for pitch shift, stutter and time jumps, controllable by sequences. 3-Band Dynamic Compressor with different reaction models. 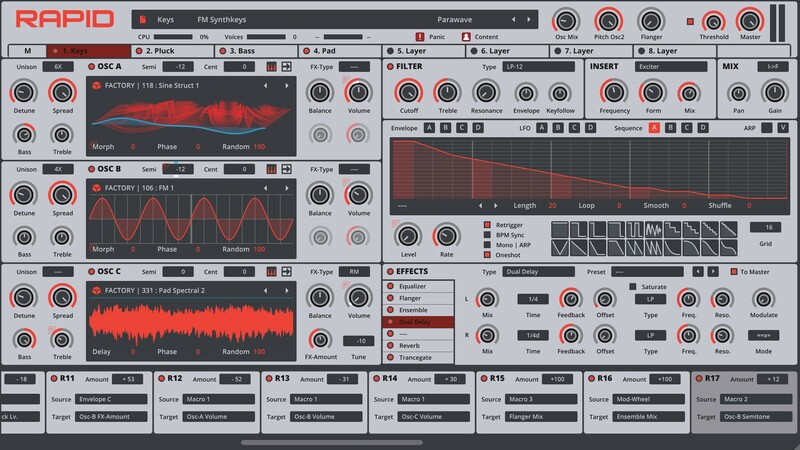 Output Limiter with automatic makeup gain. 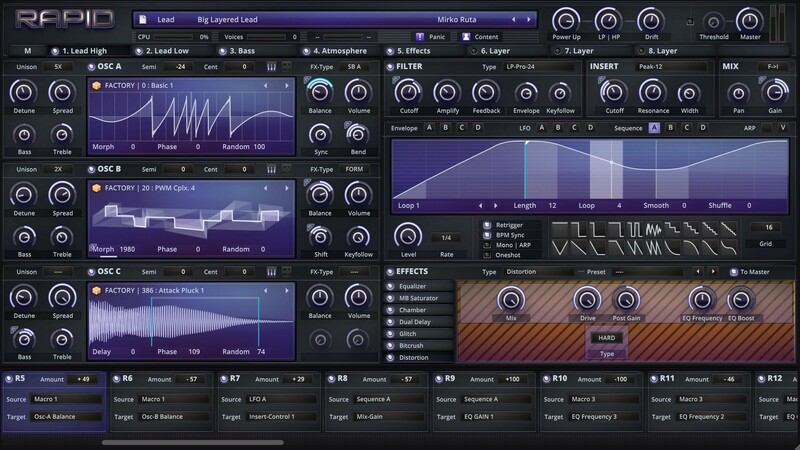 Quick Modifier for simultaneous control of Volume and Filter Envelope for all layers. 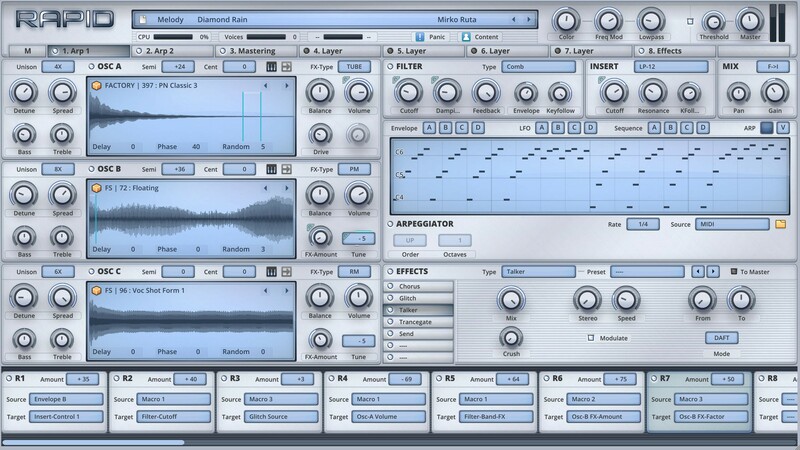 Single- & Multi-Cycle Wavetable import. Single- & Multi-Sample import with Velocity & Round Robin. Resynthesis Algorithm for new Multi-Sample generation. Archive & Installation of self contained library bundles. 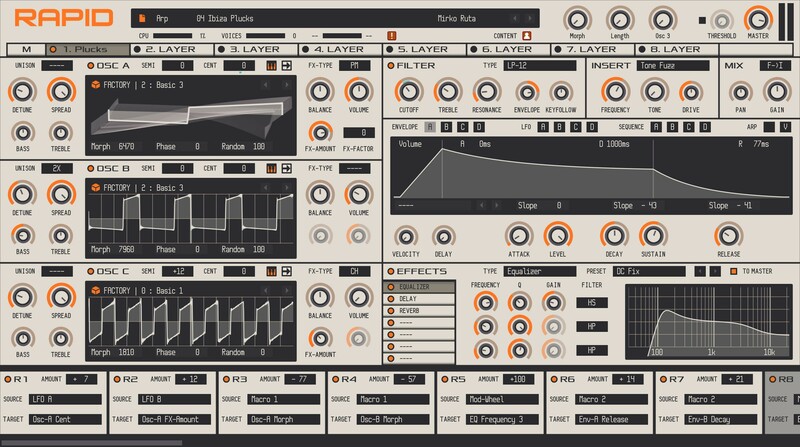 Preset Files for Modulator, Effect or Arpeggiator pattern. Copy & Paste Modulators, Patterns or complete layers. Resizeable HD graphics with 16:9 resolution. 4K Ready and scaleable up to 300%. Pure bouncing big-room power with an electric touch, giving modern productions an extra energetic pu.. Glowing warm like sunshine, inspired by classic analogue attributes, merging the best of both digita..
Palm trees swaying in the wind, a fresh Caribbean breeze and an instant beach feeling. Provided with.. Experience the emotional nature of trance music in its purest form and leap into an ocean of airy an.. 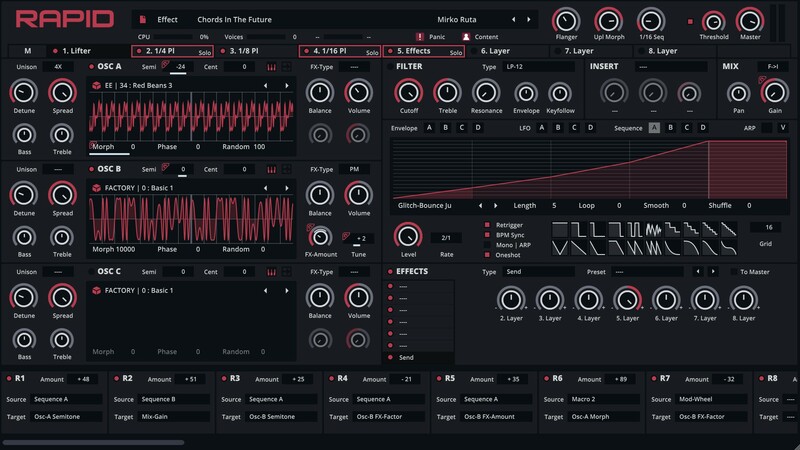 Enter the deep house lounge and dive into urban midnight vibes, fabulous laid back grooves and a r..
Future Bass is a highly innovative and modern style with a great bandwidth of sound design concept..
Start your automatic ground launch sequencer. Prepare the auxiliary power unit. T-10 seconds. Main..
Synthwave is a style that attempts to recreate the atmosphere of 1980s culture, films and video ga..